SP Setia Bhd Group today officially launched the KL Eco City Project, an integrated mixed development project that may become a new iconic landmark of Kuala Lumpur. President and Chief Executive Officer Tan Sri Liew Kee Sin said that with all the required funding secured, the 9.6-ha project was set to take off and be completed in 10 years. "The project aims to be the country's first integrated green development, targeting both the Malaysian Green Building Index and US-based Leadership in Energy and Environmental (LEED) certifications. "We are developing this project in line with the government's aim for the private sector to rejuvanate the squatter lands in Kuala Lumpur," he said at the launch ceremony officiated by Federal Territories and Urban Wellbeing Minister Datuk Raja Nong Chik Raja Zainal Abidin here. Liew said the main priority for the development now would be to solve the traffic congestion problem in the area by the completion of its first out of four phases in three to four years. "We expect 30,000 occupants in the city, comprising both commercial and residential," he said. Connectivity-wise, Liew said the group would invest more than RM150 million to link KL Eco City to all major highways. KL Eco City, a joint venture project between SP Setia through KL Eco City Sdn Bhd and Kuala Lumpur City Hall (DBKL), is situated along Jalan Bangsar, opposite the Mid Valley City. At the same event, SP Setia inked a RM460 million syndicated Islamic financing facility provided by three Islamic financial institutions for the KL Eco City project. The funding, Liew said, would be utilised mainly for the infrastructure purpose, namely the proposed transportation hub in the project itself. The banks were HSBC Amanah Malaysia Bhd, Hong Leong Islamic Bank Bhd and Bank Mualamat Malaysia Bhd. 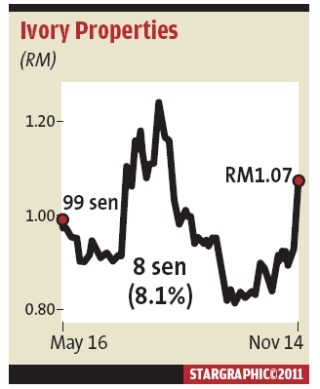 PETALING JAYA: Dijaya Corp Bhd and Ivory Properties Group Bhd shares were up after the companies announced a tie-up for a mixed-property project with a gross development value of RM10bil in Bayan Mutiara, Penang. 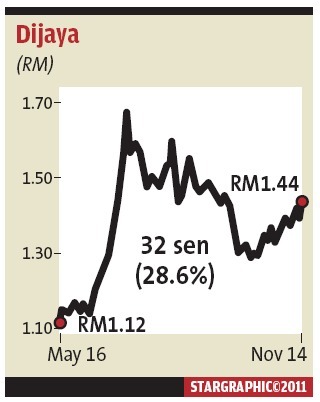 Dijaya rose 3.6%, or 5 sen, to RM1.44 while its warrants advanced 6.5%, or 3 sen, to 49 sen. Ivory Properties added 7%, or 7 sen, to RM1.07. Dubbed Penang World City, the project will be undertaken by joint-venture vehicle Tropicana Ivory Sdn Bhd (TISB), which is 49% owned by Dijaya and 51% by Ivory Properties. TISB was set up on Oct 14. Penang World City will be built on a 102.56 acre site, of which 35 acres is to be reclaimed. It will comprise residential units, a shopping mall, office suites, office towers, a hotel, retail spaces and an open mall with a boulevard. The land is being bought for RM1.08bil from state-owned Penang Development Corp.
Bayan Mutiara is a new development hub in the eastern part of the Tun Dr Lim Chong Eu Expressway and is in the vicinity of Sungai Nibong. Ivory Properties has proposed to finance the project via a renounceable rights issue of 186,000,000 new ordinary shares of 50 sen each as well as 186,000,000 new free detachable warrants. Dijaya, meanwhile, will extend financial assistance to TISB in the form of shareholder advances, guarantee, indemnity or collateral of up to RM525.4mil, or 49% of the total consideration of the development land. Analysts contacted by StarBiz have a positive view of the project, citing its prime location as a major plus factor. “Land in Penang is scarce and the outlook for housing in the Bayan Mutiara area is booming,” an analyst said. Another local bank-backed analyst said although he liked the land, he considered it pricey. At RM240 per sq ft, it was comparably higher than IJM Land Bhd's land further north of the island that was purchased at RM50 per sq ft. IJM Land has a 150.24-acre mixed-development called Light Waterfront Penang. The analyst also said the upside for Ivory Properties' stock would be capped at around 30% as its share base would be diluted by two to three times following the rights issue. He added that the choice of office towers in the development mix was surprising as the demand for office space in Penang was tepid. Nonetheless, he said the project was still at its early stage and was subject to change. “We haven't seen a detailed breakdown of the development components yet but the residential portion is likely to be larger,” he said. Penang World City is scheduled to be completed in eight years. Work on the first phase is scheduled to begin at the end of next year. 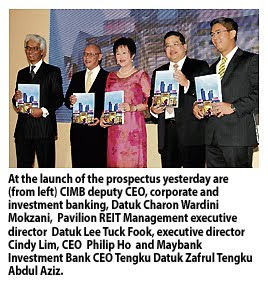 Launched: (from left) Maybank Investment CEO Tengku Datuk Zafrul Tengku Abdul Aziz, CIMB Group corporate & investment banking deputy CEO Datuk Charon Wardini Mokhzani, Pavilion REIT Management executive directors Datuk Lee Tuck Fook and Datin Cindy Lim, and Ho at the prospectus launch. KUALA LUMPUR: Pavilion Real Estate Investment Trust (REIT), en route to a listing on Bursa Malaysia, aims to add more assets to its portfolio and wants to continue its “shopping spree” to acquire at least three more retail properties within the next three years, depending on the economic situation. Chief executive officer Philip Ho told StarBiz recently that the company, which will see its post-listing loan-to-value (LTV) ratio at 20%, could either finance these additional property injections by going back to its shareholders or through bank borrowings, although the latter was the preferred option for now. “The proceeds of close to RM700mil is being utilised to pay down the debt. At 20% LTV ratio, I reckon this is a comfortable gearing ratio and will allow us to finance these acquisitions either through shareholders or with bank borrowings. We can acquire up to a billion ringgit without going back to shareholders,” Ho said. “Under Securities Commission rulings we are allowed to gear up to 50% LTV ratio. We don't intend to gear up until that high though. I think the right formula is somewhere between 25% and 30% as most of our peers would. Our balance sheet is very strong, we can still borrow money,” he added. The current Pavilion shopping complex, which has been fully occupied for two years with a potential-retailer waiting list of 200 and rental yields of about RM16 per sq ft, will begin extension works by the first half of next year. Ho said Pavilion REIT had “obtained all development approvals” for the extension. “This is an extension of about 300,000 sq ft of retail space, and will be built by Pavilion REIT's sponsors (original shareholders Urusharta Cemerlang Sdn Bhd) on the former carpark of Millenium Hotel. They (the sponsors) will also build an apartment on top of the new retail space,” Ho said. Pavilion REIT will also develop another shopping mall in UEP Subang Jaya, following the compact mall concept with an apartment block on top of it. “This will be our first foray into the suburbs and we believe this concept will work. This compact mall which will be developed by Usurharta Cemerlang will have another brand name that will be managed by the Pavilion Group,” Ho said. “We believe in our branding and good location which will enable this shopping mall to withstand the troughs of any economic crisis,” Ho said responding to qualms of the possible downward price pressure on rental yields due to oversupply. 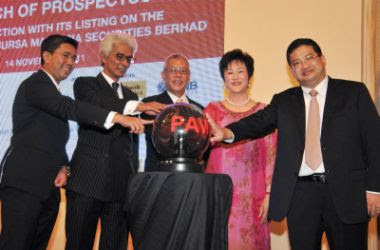 Pavilion REIT Management Sdn Bhd, the manager of Pavilion REIT yesterday launched the prospectus in conjunction with its proposed listing on the Main Market of Bursa Malaysia on Dec 7. Pursuant to the initial public offering (IPO), 755 million units would be offered to Malaysian and foreign institutional investors and selected investors at the institutional price (other than cornerstone investors) which would be determined by way of book building. A total 265 million units has been earmarked for allocation to six identified cornerstone investors at an offer price of 90 sen per unit or the institutional price, whichever is lower. The six cornerstone investors are Permodalan Nasional Bhd, Employees Provident Fund, Kumpulan Wang Persaraan, Great Eastern Life Assurance (M) Bhd, American International Assurance Bhd and HwangDBS Investment Management Bhd. “About 35 million units will be offered to the general public in Malaysia, eligible tenants of Pavilion Kuala Lumpur Mall and Pavilion Tower, directors of the manager and the eligible employees of the manager, Urusharta Cemerlang Sdn Bhd, Capital Flagship Sdn Bhd and Kuala Lumpur Pavilion Sdn Bhd at the indicative retail price of 88 sen per unit,” Ho said at the event. At an indicative retail price of 88 sen, the manager expected Pavilion REIT to provide a distribution yield of 6.41% and 6.51% for the one-month forecast period ending Dec 31, 2011 and the 12-month forecast period ending Dec 31, 2012 respectively. Ho said the total appraised value of Pavilion REIT's initial property portfolio was about RM3.5bil. With the inclusion of Pavilion Kuala Lumpur Mall, which forms 96.4% of the total appraised value of Pavilion REIT's initial property portfolio, Pavilion REIT would become one of Malaysia's largest listed REITs with the largest exposure to the retail sector of any listed Malaysian REIT by appraised value. “Based on an indicative retail price of 88 sen, Pavilion REIT is expected to achieve a market capitalisation of RM2.6bil upon listing,” he said, adding that Pavilion REIT remained an attractive option for investors looking for liquid investments in Malaysia's retail and corporate property sector. On a pro forma basis, he said Pavilion Kuala Lumpur Mall and Pavilion Tower, collectively, achieved revenue of RM291mil and net property income of RM203mil for the financial year ended Dec 31, 2010. KUALA LUMPUR DKLS Industries Bhd has proposed to participate in the acquisition of a property in Melbourne for A$13.3 million (RM42.96 million). In a filing to Bursa Malaysia yesterday, the company said the property in Bourke Street, Melbourne, comprises an existing building erected on a piece of land measuring 1,162 sq m.
The existing building was completed in 1931 and was utilised as Barristers Chambers. It comprises five levels plus basement, mezzanine and a rooftop caretakers unit. There are also two prime Bourke Street shops and six on site car parks. The gross building area of the existing building is measuring approximately 5,228 sq m in area. The existing building is currently vacant except for the two Bourke Street shops which have been leased to two separate retail tenancies. The company said the existing building was ideal for a range of uses such as commercial owner-occupation, strata subdivision, investment or hotel conversion. "DKLS proposes to refurbish, re-lease and hold the existing building as a central CBD (central business district) office investment. It is also ideally suited to strata subdivision and selling down to barristers, lawyers and other professionals. "The cost of refurbishment of the existing building is estima-ted at A$3 million (RM9.69 million)." KUALA LUMPUR: DKLS Industries Bhd has proposed to take part in the acquisition of a property in Melbourne for A$13.3mil (RM43.04mil). The company told Bursa Malaysia the property in Bourke Street, Melbourne, comprised an existing building on 1,162 sq m.
The existing building was completed in 1931 and was utilised as Barristers Chambers. It comprises five levels plus basement, mezzanine and a rooftop caretakers unit. There are also two prime Bourke Street shops and six on-site car parks. The gross building area of the existing building measures about 5,228 sq m.
The existing building is now vacant except for the two Bourke Street shops which have been leased to two separate retail tenancies. DKSL said the existing building was ideal for a range of uses such as commercial owner-occupation, strata subdivision, investment or hotel conversion. Properties worth about RM940mil will be up for grabs at the three-day Negri Sembilan Mapex to be held in Seremban beginning Nov 18. The event, to be held at Seremban Parade, will be the biggest held to-date and will showcase dwellings priced as low as RM36,000 to a cool RM1.6mil. State Real Estate and Housing Developers’ Association chairman S. Sivanyanam said 22 developers would be taking part in the event with 2,330 units ranging from single-storey terraces to bungalow lots up for sale. “We had had to turn away several other developers due to space constraints. Despite this, we are confident that the Mapex will receive an even greater response from buyers this time around,” he told reporters. Also up for sale at the event themed “Affordable, Accessible, Quality Living” are parcels of commercial land worth between RM729,000 and RM19.1mil, shop offices (RM180,000-RM1.28mil), bungalow lots (RM53,980-RM200,395) and single and double-storey semi-D units (RM260,000-RM1mil). Among the 2,330 units, 469 are double-storey units, single-strorey terrace (436), double-storey semi-D (269), commercial units (260), shop offices (233), and low and medium-cost apartments (271). Sivanyanam expressed confidence that more buyers from outside Seremban, particularly the Klang Valley will make a beeline to buy properties in Negri Sembilan during the event due to the much lower land prices. “Some of the developers will also be offering incentives such as legal and disbursement fee waiver and stamp duty exemption and this will mean substantial savings for the buyers,” he said. There would also be guaranteed rental returns, cash rebates and discounts, free feng shui consultation amd zero interest during construction of the said property. Sivanyanam said at the state-level Mapex held from May 20 to 22 this year, 84 units of properties worth RM20.6mil were sold. Then, 1,630 properties worth about RM460mil were showcased. This time around, a lucky draw of five 32-inch Samsung LED television sets will also be held on Nov 20 for all housebuyers. All housebuyers who sign the sales and purchase agreement during the three-day Mapex will be entitled to a Touch&Go card worth RM110. Tiger Synergy Bhd, a Malaysian developer, rose to a five-month high in Kuala Lumpur trading after saying it expects to make a RM68 million profit from a condominium project. Its shares gained 7.4 percent to 14.5 sen at 9:05 a.m. local time, set for their highest close since June 2. KUALA LUMPUR: Malton Bhd is acquiring 56.05 acres in Ulu Kelang for RM105mil for a residential project with an estimated gross development value of RM500mil. The company said in a filing with Bursa Malaysia that its wholly owned subsidiary, Gapadu Harta Sdn Bhd, had entered into a sale and purchase agreement with Ukay Spring Development Sdn Bhd to acquire the land. The acquisition would be financed by internal funds and/or bank borrowings, said Malton. KUALA LUMPUR: En route to a listing, Pavilion Real Estate Investment Trust (REIT) plans to buy three shopping malls, namely the Fahrenheit88, the extension to Pavilion Kuala Lumpur Mall (Pavilion Mall) and a soon-to-be-developed mall in USJ Subang Jaya, within the next two years. Pavilion REIT Management Sdn Bhd chief executive officer Philip Ho said this is part of Pavilion's growth strategy as outlined in its prospectus. "We believe our listing will serve to enhance the growth of our retail and corporate property business. We hope to provide a platform for investors to invest in a REIT that provides a stable distribution income, capital appreciation as well as opportunities to benefit from its future acquisitions of yield-enhancing assets," he said at the launch of Pavilion REIT's prospectus here yesterday. Speaking to reporters later, Ho said Pavilion plans to acquire Fahrenheit88 by 2013, Pavilion Mall's extension by 2014 and a retail mall in USJ Subang Jaya by 2015. Currently, Pavilion has secured the right of first refusal (ROFR) for the acquisitions of Fahrenheit88, and the Pavilion Mall extension, both of which are close proximity to Pavilion Mall. It has also obtained the ROFR for a six-storey retail mall to be developed in Subang Jaya. With an appraised value of RM3.54 billion, Pavilion REIT is currently made up of two assets - Pavilion Mall and Pavilion Tower. The mall, which contributes 96.4 per cent to the appraised value, has 1.3 million sq ft of net lettable area, with about 450 retail tenants, making it the largest premium retail fashion mall in Malaysia. The award-winning mall, which was completed in 2007, is strategically located in Bukit Bintang, Kuala Lumpur. Meanwhile, Ho said, the Pavilion Tower offers a premium corporate and business address and spans over a net leaseable area of about 167,000 sq ft.
Based on the indicative initial public offering (IPO) price of 88 sen per unit, Pavilion REIT expects to raise some RM695 million, making it one of Malaysia's biggest IPOs for the year. With an appraised value of RM3.4 billion for Pavilion Mall, Pavilion REIT will also bear the distinction of being the Malaysian REIT with the largest portfolio of retail assets upon listing, slated for December 7. For its IPO, Pavilion is offering 790 million shares, of which 755 million units will be offered to Malaysian and foreign institutional investors and selected investors at the institutional price, while 265 million units have been earmarked for allocation to six identified investors at an offer price of 90 sen per unit or the institutional price, whichever is lower. The balance 35 million units will be offered to the general Malaysian public and eligible tenants of Pavilion Mall and Pavilion Tower, among others.